The lavender Heating Pillow relaxes your sore and stiff muscles and relieves abdominal or back pain. The lavender Heating pillow relaxes your sore and stiff muscles and relieves abdominal pain or back pain. 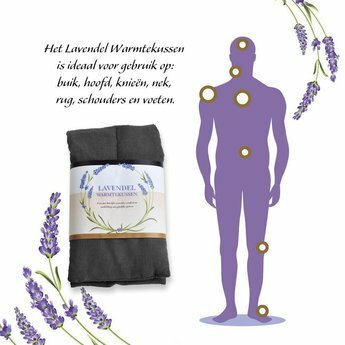 The lavender Heating pillow contains lavender pieces, they provide a wonderful lavender scent. So relax on a natural way your body and your mind. The lavender Heating pillow is quick and easy to heat in the microwave. The pillow shapes itself easily to your body and gives a pleasant warmth. Very easy to heat in the microwave: maximum 60 seconds to up to maximum 1000W.